bringing you one step closer to the pleasures of cider drinking in Europe. Cheers! Farmhouse is another cider from the Ramborn’s lineup that I’m trying out. It is a blend of three apple varieties Erbachhofer, Holzapfel (also known as the European crab apple), and Wiesenapfel, all indigenous to Luxembourg and surrounding areas, where the cidery is located and sources its apples. 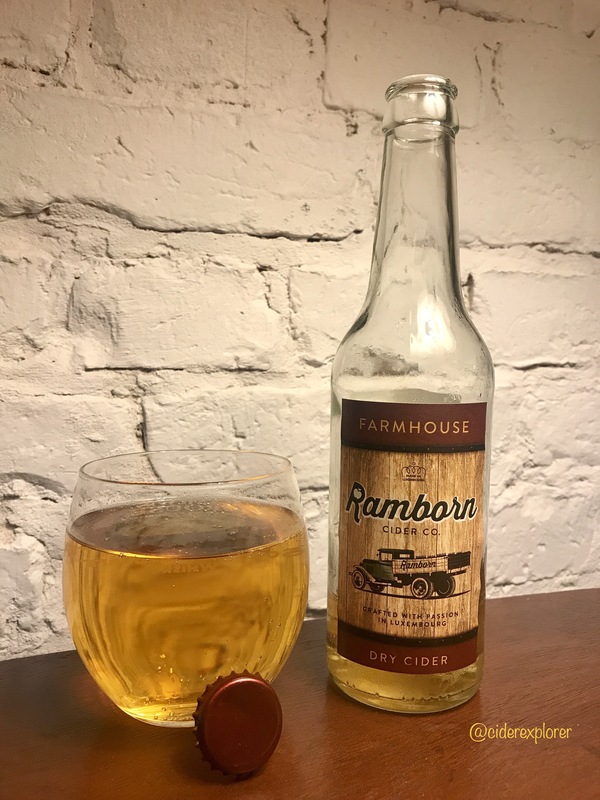 Company: Ramborn Cider Co. Appearance: pours a clear pale amber with orange hues and a short-lived white head. Carbonation is artificial but long-lasting and low. Body is light. Aroma/Nose: the nose exhibits fruity flavours of red crisp apples and apple juice, which then give way to more intense notes of caramel and wood. Taste: my first sip is dry with a nice level of residual sweetness and moderate, refreshing lemon-like acidity. Crunchy red apple, yellow apple, pear, white wine and wood with a distant freshly milled wood come through on the palate. It finishes with a delicate lingering wood-like, but not spoiling, bitterness and astringency with a hint of honeydew melon. Availability: locally everywhere in Luxembourg, e.g. in a supermarket Cactus in Remich. In Germany available through The Hop Shop Trier and online through Ciderei. In Italy from Sidro & Cider. In the Netherlands from CiderCider. Price: Ramborn Cider Co was kind enough to send me a sample of this cider.